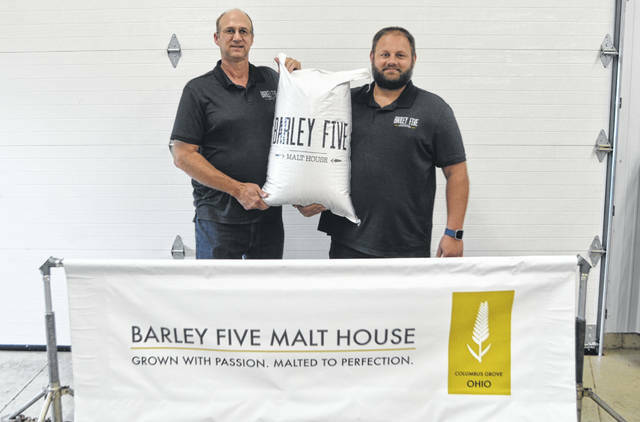 Barley Five Malt House Managing Partner and Maltster Roger Recker and Managing Partner Cory Maag have recently opened Barley Five Malt House on 9242 Road Z.
COLUMBUS GROVE — Not even a year after opening the new malt business Barley Five Malt House on 9242 Road Z has already received recognition for its products in the tri-state. Six years ago Barley Five Malt House Managing Partner and Maltster Roger Recker began his journey growing two-row barley. As a farmer, Recker said planting the barley was not much of a challenge, but the malting process — creating the malt out of barley — was more scientific than he had expected. The two-row barley malt has a different flavor than most other commercial malts because it grows during a different time of the year and is grown in a different climate, according to Maag. Since opening in February the family business has been producing base pale malt and has been experimenting with several specialty malts, which are typically darker than the regular malts because it provides flavor and coloring. The business has donated several 50-pound malt bags to breweries in Northwest Ohio in hopes of selling their product. Homebrewer Ben Martin, who uses the Barley Five Malt House malt in his brew, won first place in both Sour Ale and American Wild Ale categories at the 2018 Indiana Brewers’ Cup.